Former UKIP leader Nigel Farage is set to speak at an ‘alternative Nobel Prize’ ceremony in Stockholm, organized by the far-right Sweden Democrats, where he is expected to win an award. The nationalist party has hired out Stockholm’s Grand Hotel for the ‘European Freedom Awards’ in November, the Swedish newspaper Expressen reports. 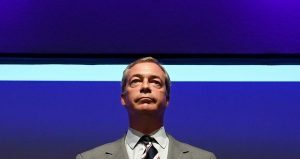 Far-right politicians from a dozen countries are thought to be in the running for the award, including Farage, one of the pilots of Britain’s successful Brexit campaign. NATO representatives and several US politicians have also been invited. According to Expressen, the bill will be footed by European think tank IDDE (Institute for Direct Democracy in Europe) and pan-European party ADDE (Alliance for Direct Democracy in Europe), which both SD and UKIP are members of. Farage reportedly has a plan to tour European countries this autumn in an attempt to encourage more independence referendums. Growing anti-EU sentiment has been seen in Austria, Finland, Denmark, Sweden, France and Italy in recent months.